This wonderful, Balearic tinged Disco rarity is getting the official reissue treatment finally! 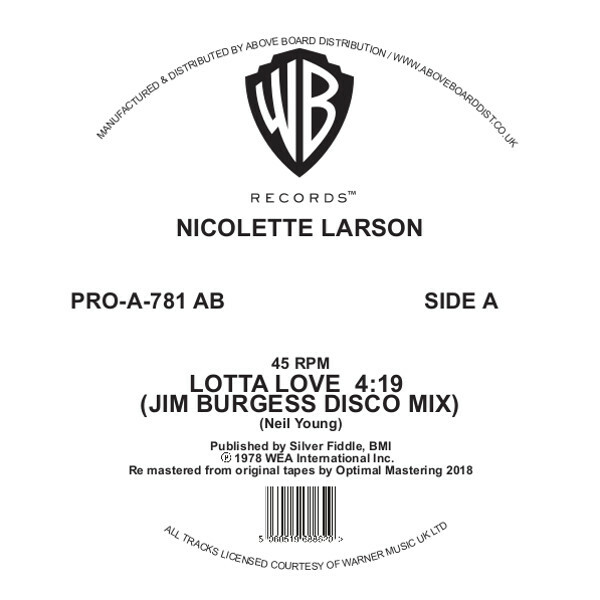 Nicolette Larson's 'Lotta Love' has long been a sought after jam, with the promo only 12" version changing hands for big dough! 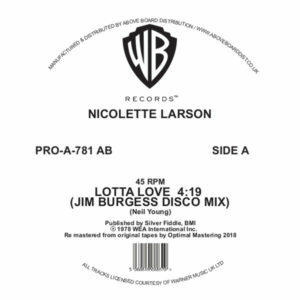 Mixed by the legendary Florida born and NYC dwelling mixer and DJ extraordinaire Jim Burgess, this one straddles that gorgeous line of being a bit Rock (Neil Young wrote the track) and totally Disco in all the right ways. A truly sweet slice of music here backed with a nice cover of Sam Cooke's classic standard 'You send me'. Often bootlegged, there's been some shoddy facsimiles kicking around over the years this high quality, official, 100% legit reissue has been lovingly remastered by Above Board distribution in conjunction with Warner Brothers from the master tapes. What more can you ask for? This 2018 repress is a reproduction of the 1978 WB promo only 12" complete with Warner Brothers artwork. Essential business.